Hello ..... I am so behind...I was out of town on the Die-Versions new release night...YIKES!!! The theme for June is Life's a Beach! These adorable Palm Trees and Made in the Shade Umbrella made a nice scene for the sentiment (Umbrella set by Stampendous). Kraft card stock from several companies (my favorite is Desert Storm by Neenah), were torn and sanded. Trees were die cut in white, then colored. Cut the Umbrella two times (once with patterned paper) and off set it slightly. So cute! 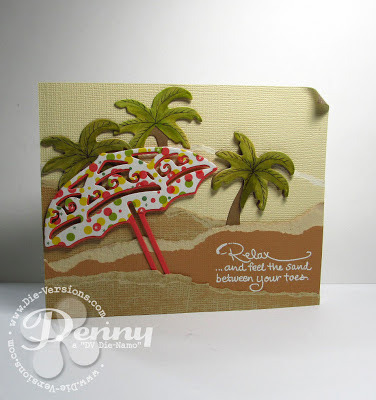 Love the torn paper for the sand and the palm trees are on my list. Palm trees turned out really cute! Penny, this is a mini vacation in a card. :) The torn paper is fantastic!